We are a full service electrical contractor providing honest, competitively priced 24-hour service to homeowners and small businesses throughout Montgomery Co. and surrounding areas. We provide emergency or scheduled residential and small commercial service for any electrical need. Today it takes expert electricians with an understanding of the most up-to-the-moment innovations in electrical design and technology to correctly support your in-home electrical requirements. Strategically located in The Woodlands, we have evolved over the years as your 'One Source' supplier for all of your electrical installation and service needs. Times and technology have changed, but our focus on honest service hasn't. That's why repeat customers make up a substantial part of our business. 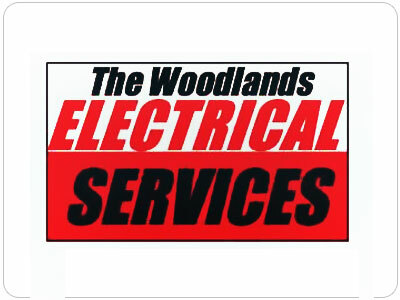 Our commitment to providing our customers with the highest quality service / products at affordable rates is what makes The Woodlands ELECTRICALSERVICES the obvious choice to meet your needs. Please take some time to browse our website and learn about the various services and products we offer. Any questions? Feel free to contact us. Thank you! **Don't Pay For Over-Priced Franchised Service Electricians! Support Your Local Woodlands Independent Contractors. We have had continual problems with our canned lights. Chris knew exactly what the problem was, replaced them with new LED lights and all of our out of date fire alarms. He worked quickly, efficiently and was inexpensive. I would be delighted for him to d..